Mise en place for turkey stock/gravy. Photo by Donna Turner Ruhlman. A no-brainer if you make excellent turkey stock now! I’ll be doubling or tripling the below recipe this year. Today, I’ll be roasting drumsticks, wings, and necks. (I read on Wednesday in the Times that the venerable Jacques Pépin picks the meat off the neck of the turkey and adds it to the gravy. I might try that this year.) Roasting them will give your stock a nice flavor. All that golden brown roasted skin above? Equals flavor. I’ll taste it. I may reduce it further but usually it’s pretty good by now. I happen to have some veal stock on hand from another project. I’ll add that because veal stock puts everything over the top. I’m unaccountably lucky to be able to work from home, so this is easy for me to do today while I’m working. But the weekend is near, so if you plan ahead, pick up some turkey bones and roast them over the weekend, then cover them with water and put them in an oven at 200°F or below overnight. That’s how great gravy begins. And it’s Friday, and cold, so maybe a hot TurkShot will be an end-of-week libation. Put the turkey bones in a big pot and cover them completely with water, 3–4 quarts/liters, and put the pot over high heat. Turn your oven to 180°–200°F/80°–90°C. When the water comes to a simmer, put the pot in the oven for 8 hours or overnight. Add the remaining ingredients (if you don’t have enough room, remove the turkey bones—they will have cooked out by now). Bring to a simmer, then reduce the temperature to low and cook for another hour or so. Strain into a clean pot. Cool, then refrigerate. Reserve any fat that’s congealed on top for the roux on Thanksgiving day. Reduce the stock to 1-1/2 to 2 quarts/liters if it’s not already at that level. The Friday cocktail hour recipe is a savory drink. To serve this turkey stock–based cocktail cold, add 2 ounces of tomato juice, use Sriracha or Tabasco for heat, and serve over ice. Brussels sprouts are a great fall side dish, especially for the holiday. My post on stock clarifications. Keep in touch with my by following me on Twitter @ruhlman. Turkey Stock: Oven Method is another great way to make stock, the day after Thanksgiving. I made some duck confit a while back and froze the juices that I separated from the fat. Should be a nice addition to the turkey broth. Never thought to use the turkey fat as the roux base for the gravy (although I do use it to baste the stuffing)…will be doing that this year. Still Making (and loving) your Dutch oven bread… made my stuffing croutons for Thanksgiving last night with 1/2 a leftover loaf and that Turkshot sounds fantastic!!! It just may be a better cure for the common cold than chicken soup! Gravy & sneaked in cocktail that is probably delicious if your recomending it. I would use a turkey wing for garnish. Might Sound strange, but so does the Turkshot. It sounds pretty darn good actually! Aged eggnogg season, I have one small bottle 3 years old, wrapped in foill to keep it out of the Light & kept it cold all this time. I will tap into it next week, out of town for Xmas, so early cellebration this year. Cheers, happy Friday & holliday kickoff all! This is the second savory cocktail I’ve seen! The first was the River Cottage’s bullshot. I’ve yet to try it, but I think I may just have to try it this time! Where are you able to buy just wings and drumsticks? I swear I’ve never seen this at the store before. 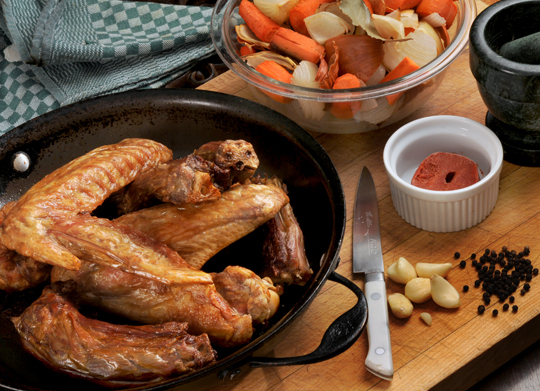 Sometimes you’ll find turkey parts next to the chicken – breasts, wings, legs. Should be near the ground turkey. I just went to Grocer and asked for 4 pound of wings – depending on the grocer they will likley be cutting stuff up like this. I used similar ingredients but made the stock in a pressure cooker. Came out great. pressure cooker stock is amazing. but critical to let the pot cool naturally, not hit the steam release button. You might want to check your oven’s manual before the overnight step – mine will automatically shut off after a certain amount of time (maybe 6 hours) unless I use a special setting. My stock is made! I was so happy to have this recipe last year. I am sure it will be this year. Two quarts in the fridge now. Happy Thanksgiving! and to you too, Lisa! What a stress free way to make the gravy. Usually i take the turkey drippings, etc and it just jams up the kitchen. Thanks for the reminder. Turkey legs are roasting now and they smell terrific. I love the overnight stock method. It’s been our go-to for a while. Actually the first time we used it was with the Thanksgiving turkey carcass. A nice aroma to wake up to on Friday morning. I’ve never made turkey stock, actually, because we only seem to eat turkey on Thanksgiving and I have never contributed anything but sides and desserts to Thanksgiving. Is tomato paste something you use in other stocks, too? I have made chicken stock a hundred times, and beef, veggies, and fish stocks occasionally… but have never used (or thought to use) tomato paste. T paste is something I use in a lot of stocks but…I roast it along with the bones and vegetables. Just fill the roasting pan with whatever you use to make the stock with and plop the tomato paste on top, toss it all and place in the oven. Other than some minor diversions in technique from Mr Ruhlman’s recipe above you are good to go from there. Tomato paste adds sweetness and an appealing color to most meat and vegetable stocks. wouldn’t use it for fish stock. Don’t know how I’ve missed this. I’m thinking it will be especially welcome in veggie stock. Thanks! Hi,Michael,I’m an editor from Shanghai,China,and I’m interested in your book”The Making of A Chef”.I’d like to buy this copyright if it is possible.So could you tell me which one should I get in touch with?Thanks a lot! I sent you an email; let me know if you didn’t receive. Looks awesome. I didn’t roast my turkey pieces, but my stock still tasted good. I did it my grandma’s way with just starting three turkey wings, and placing them in cold water with herbs and aromatics, and then skimming off the fat. after simmering it for 3 hours. It tastes good but doesn’t have the rich color. Next time I may try roasting.